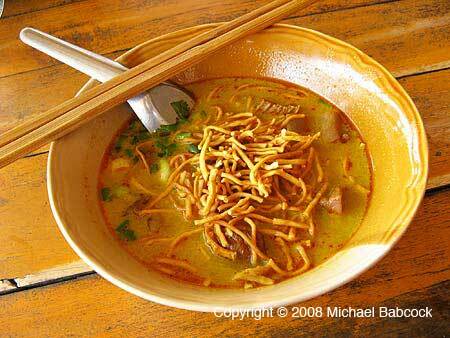 This is a bowl of Chiang Mai-Style Curry Noodles (Kao Soi), from a recent trip to Thailand. It's not quite ready to eat – there's a number of condiments that are traditionally added. Kasma's trips to Thailand always get at least one bowl of this delectable treat. Kasma teaches Kao Soi in Series Set B (class 1).